Riyadh, 20 September 2018 – This Saudi National Day, Al Faisaliah Hotel Riyadh is honored and proud to invite guests to celebrate this historic day with a host of festive experiences and extraordinary culinary treats. A key part of Saudi history, the day celebrates the 88th Saudi National Day and the establishment of the Kingdom of Saudi Arabia by King Abdulaziz in 1932 and symbolizes the ideals and hopes of the Kingdom. It provides a sentiment of pride for the country and symbolizes a sense of appreciation by the citizens, being proud of everything that the country has achieved. Located in the heart of Riyadh, Al-Faisaliah Hotel will look to showcase its deep appreciation and patriotism for the kingdom and its citizens, while reflecting the spirit of the day for three days from September 21 to 23, 2018. Guests staying at the hotel will get the chance to enjoy traditional folk culture and authentic Saudi cuisine, allowing them to truly feel part of the warm and rich Saudi culture, which has continued to experience tremendous development over the past several decades. 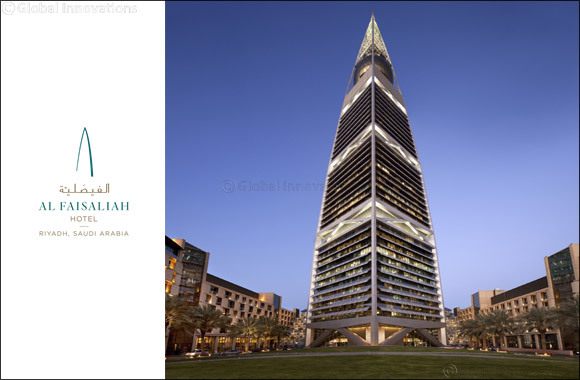 The highpoint of the celebration will be experienced on the National Day - September 23rd, with the entire Al Faisaliah Tower turning green to symbolize growth, new life and peace, as well as spring, youth and determination. At the lobby of the tower, a Saudi traditional sword dance “Ardah” will take place to showcase the traditional culture of the Kingdom. The hotel will also host a green and white cake cutting ceremony at the lobby on the day, which will proudly display the kingdom’s flag colours. Other treats for guests include performances by Saudi music artists, including a pianist and a oud player, who will entertain the audience at the lobby. Special food & beverage menus offering a wide selection of new dishes and refreshments, and added in-room amenities, will also be available only during these celebrations. Guests staying at Al Faisaliah Hotel Riyadh can take advantage of a special National Day promotion valid between the 20th until the 25th of September and enjoy a night of luxury living for just SAR 900.